For this weeks feature we’d like to highlight Vegas Summer League alumni Lauren Niemeira on her rising success. Lauren was a VSL intern in 2012 and 2013, and worked with the game operations crew. Now, Lauren is training with the NBA Referee Development Program with the goal of one day officiating in the NBA. 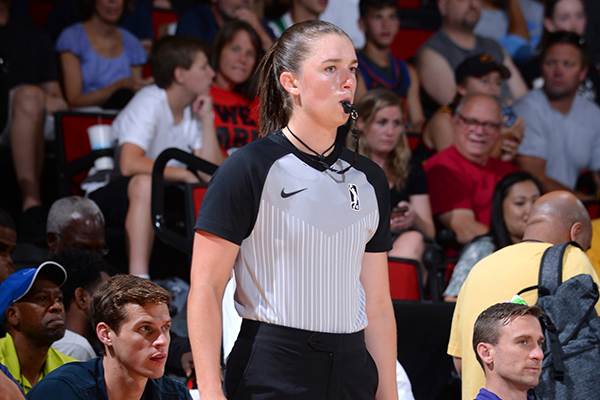 Lauren even found herself back at this year’s NBA Summer League, but instead of wearing her staff uniform she was sporting her black and white referee uniform on the court. In March 2014, Lauren Niemiera became the Sky’s Media & Communications Coordinator. During Niemiera’s meeting with owner Michael Alter, executive Adam Fox and then-coach Pokey Chatman, she was asked what she saw herself doing in five to 10 years. 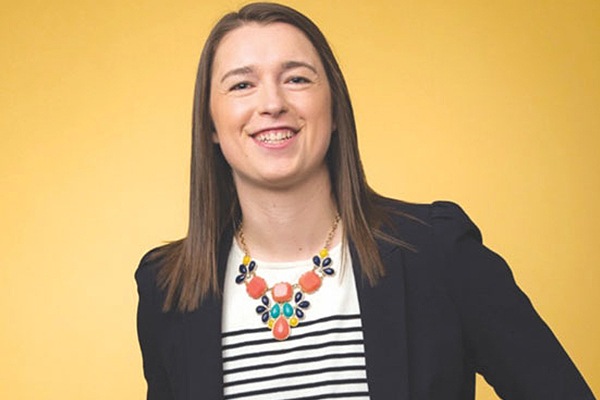 Niemiera, who played college basketball at Bradley and graduated from Marist High School, already was officiating high school games and was honest with Sky brass, for whom she had worked multiple internships. She told them she could envision taking refereeing seriously as a career path. “I liked this opportunity with the Sky because it would allow me to continue to do both things because the WNBA season is in the summer,” said Niemiera, who added how much she appreciated the Sky’s support. Not even five years later, Niemiera is on track. Niemiera worked with the Sky until the summer of 2016, when she made the move to the NBA’s referee development program. She worked this year’s NBA Summer League in Las Vegas and will make her G-League debut this fall. Long term, her goal is the NBA, and Niemiera also wants to stop in the WNBA. “It makes it really easy to wake up every day and work hard, whether it’s going to the gym and working out or being in the rule book or watching film, just because these are things I know that I’m shooting for,” Niemiera said. Niemiera, 28, ended up in the program, in part, thanks to the impression she left in 2012 as a game operations intern at the Las Vegas Summer League. While throwing T-shirts and gathering participants for contests, she was noticed by George Toliver, NBA’s associate vice president of referee development. Toliver saw how Niemiera carried herself and asked if she had thought about officiating. The idea resonated with Niemiera, who kept in touch with Toliver and provided updates on her progress. In the fall of 2015, Toliver called Niemiera about joining the development program, and after a lengthy interview process, Niemiera was accepted and plunged into her officiating career. Perhaps, but Niemiera also is creating her luck.